Bridge L1393 is a two-span deck girder bridge that consists of two wrought-iron deck plate girders supported by a rock-faced, ashlar, limestone substructure. 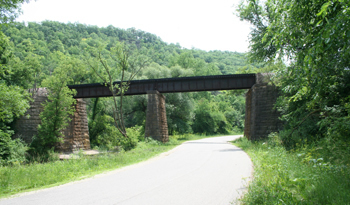 The bridge is located in rural central Winona County and carries a single-track railroad over County Highway 12 and Garvin Brook. The bridge was built in 1882 by the Chicago and North Western Railway and is significant as Minnesota's oldest plate-girder highway crossing. It also is a very rare example of wrought-iron construction, which dominated American metal-bridge building until it was replaced by structural steel in the early 1890s. Design and construction of a two-span, riveted, built-up, wrought-iron plate girder railroad bridge overpass. limestone blocks laid in uniform rows.